It’s been one hell of a year to say the least, particularly for those of us based in China. We’ve seen ‘The Tweeter in Chief’ launch (and then halt) a trade war between the world’s two leading economic powers, Fan Bingbing disappear and then reappear (with a major fine to pay) and another record-breaking Singles’ Day haul for Alibaba. To wrap up 2018, our editorial team has put together a list of the year’s most unforgettable viral stories, recounting major occurrences that defined the worlds of sports, tech, arts, fashion and food. 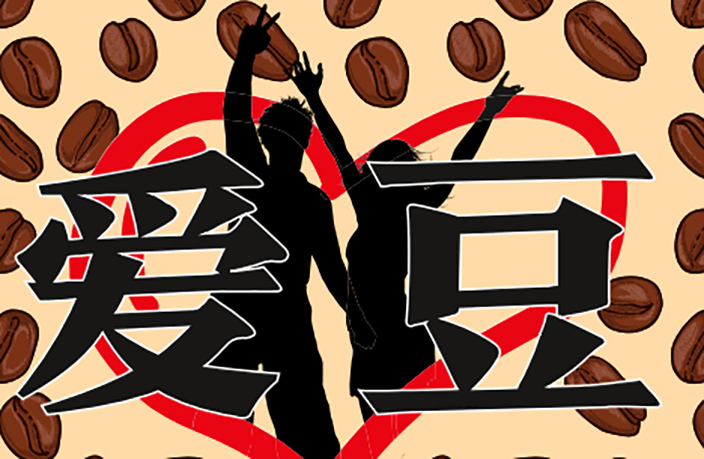 Here’s to another year of eclectic, weird and wonderful life in China, we wouldn’t have it any other way. 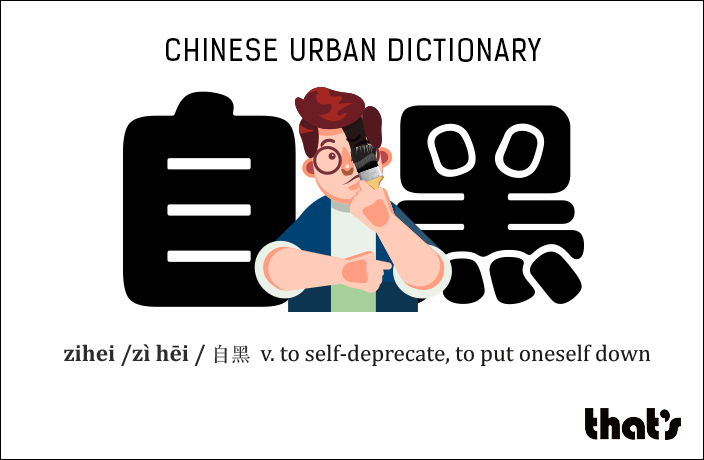 Each month, Mia Li introduces you to a trending phrase in our regular 'Chinese Urban Dictionary' series. Here's a look back at some notable highlights from the series in 2018. 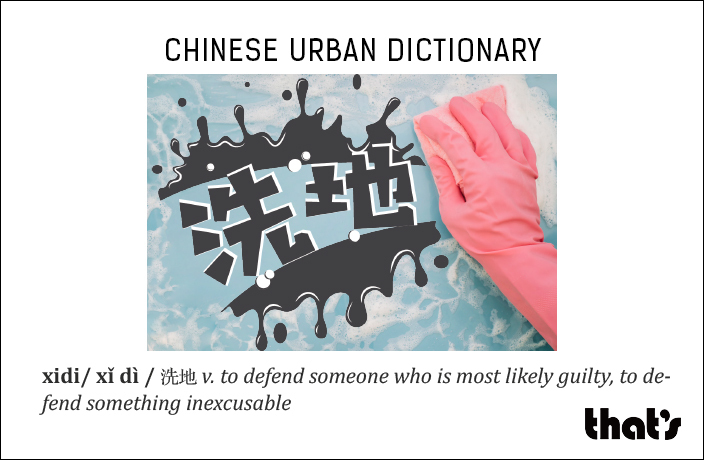 What it means: To defend someone who is most likely guilty, to defend something inexcusable. A. I'm only saying that if I was a Wall Street banker, I’d totally grab the opportunity to make millions, too. B. Look at you xidi for the bankers who caused the recession! How much did they pay you? A. Would you have left money on the table, if it had been you? Read the full definition here. 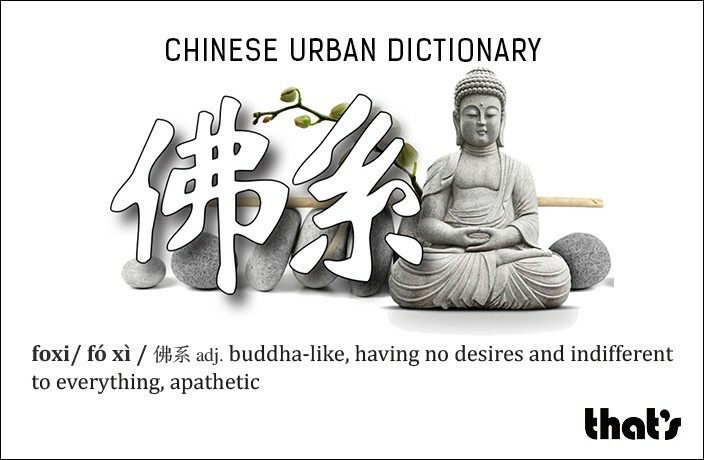 What it means: Buddha-like, having no desires and indifferent to everything, apathetic. 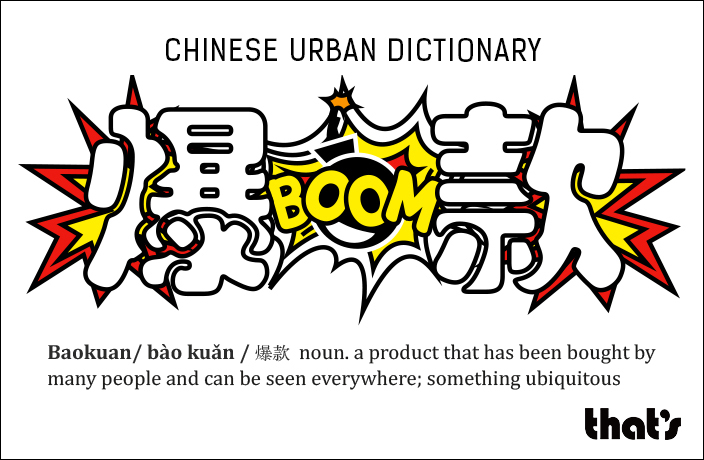 What it means: A product that has been bought by many people and can be seen everywhere; something ubiquitous. A. Look, I just got the new iPhone! B. You’re still buying iPhones? How pedestrian. They are the baokuan of phones. A. Well what phone do you use? B. I don't use one. People have to fax me. What it means: To self-deprecate, to put oneself down. A.You have so many friends. Must be nice to be popular. B. I'm sure my parents pay them to hang out with me. Haha. A. So do my parents, but no one wants to take the payment. Haha. B. Is this a zihei competition? What it means: To live off your parents or grandparents. B: I'm trying to gain a following on Youku so I can become a professional Youku'er. A: Who pays your bills? A: So you kenlao full-time. What it means: To compete for more social status and wealth by using one’s father’s social status and wealth. A: Look at Little Zhang. He is the CEO of a big company at the age of 26. B: Look up who his father is and you’ll understand. A: Oh, wow, he is winning the game of pindie. 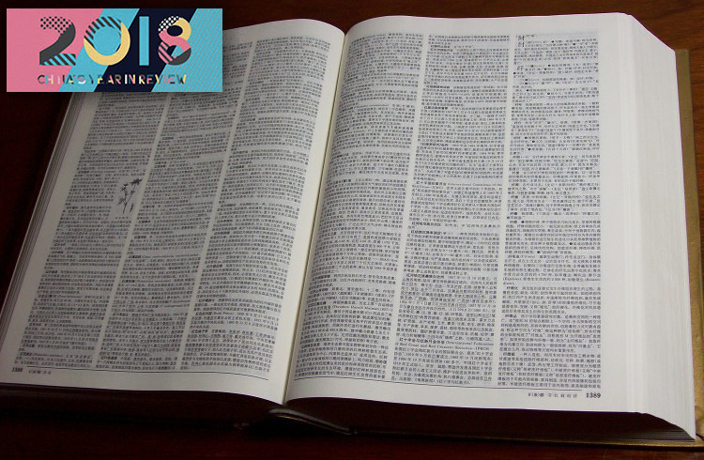 What it means: Substantive information that's often obscured by unnecessary fluff. A: Did you read the annual report Jeff submitted yesterday? B: Yeah, it's full of clichéd slogans and empty words. 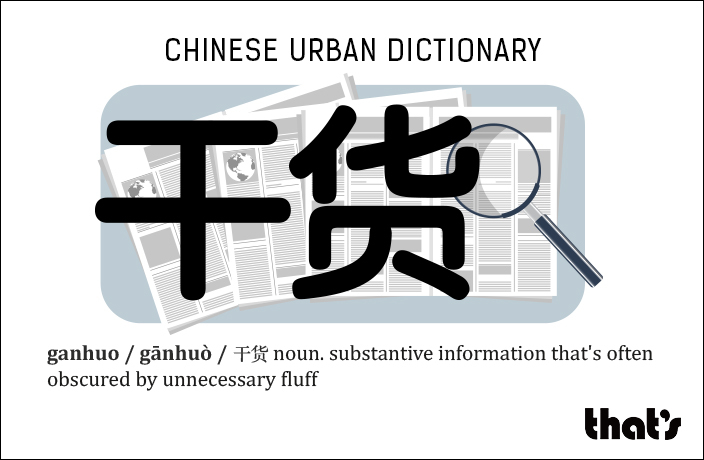 No ganhuo. A: That's because he's trying to hide the fact that he hasn't done anything all year. B: Damn, I can relate to that. 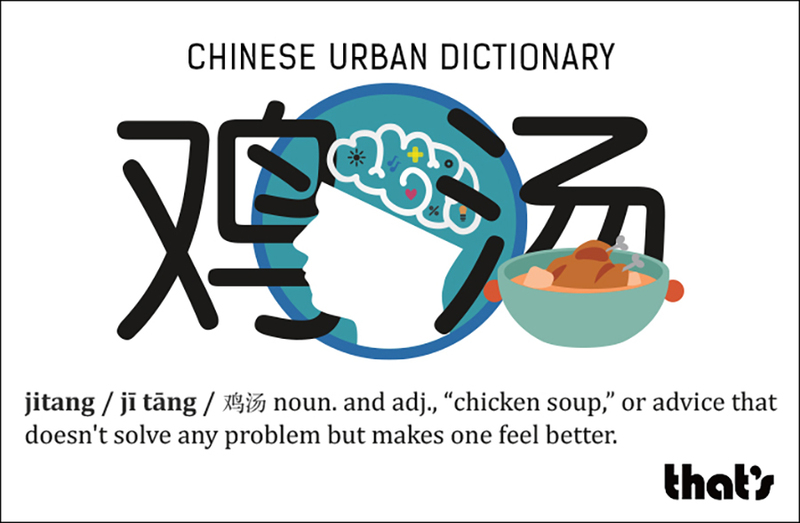 What it means: “Chicken soup,” or advice that doesn't solve any problem but makes one feel better. A: Come out drinking with us! A: No you don’t. You just need to stop and smell the roses. B: Stop feeding me jitang. Don’t you have any real advice? What it means: People who argue for the sake of arguing and young people who argue in order to feel a sense of intellectual superiority. A: I love visiting the jianbing stand on my street corner every morning. B: Jianbing are super oily and bad for you. You may as well just drink oil. 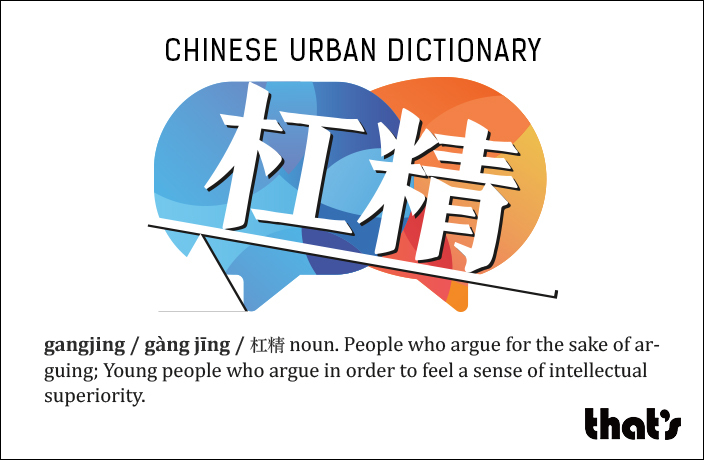 A: I don't want to argue with you if you are going to be a gangjing. Whatever you say is right. B: It's impossible for whatever I say to be right all the time. You are wrong again. What it means: To spend a lot of money playing a game, or on in-game purchases. A. Ah that guy just killed me! I didn't do anything to him. Why? B. Because he can. Look at all the weapons he has. He is a kejin player. A. But I want revenge! B. Then you better kejin too! 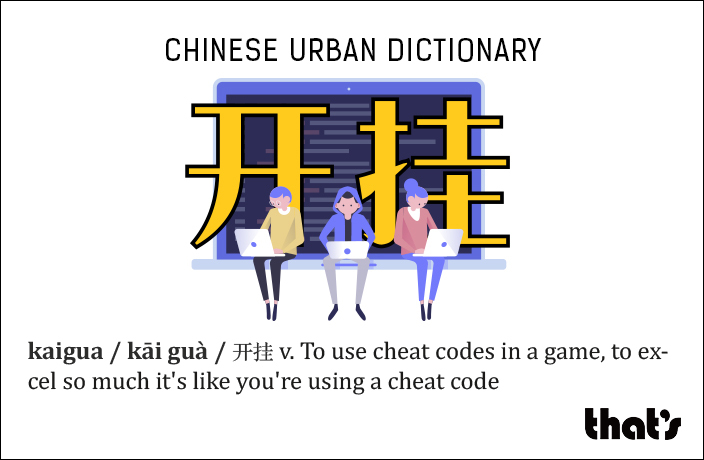 What it means: To use cheat codes in a game, to excel so much it's like you're using a cheat code. A. The CEO of this billion-dollar company is only 22 years old. B. I’m the same age but I’m broke. A. He must know something we don’t. B. What a Kaigua life he has. We’ll never get to his level. What it means: Idol, a celebrity, usually an entertainer that one approves of and supports at high cost. A. My Aidou is the most handsome of all. B. He is such a shallow human being. Nothing but a pretty face. At least my Aidou has talent. A. He has to with that ugly face. For more 2018 Year in Review coverage, click here. Kaigua refers to what we think those overachievers seem to have done to advance so much in so little time. 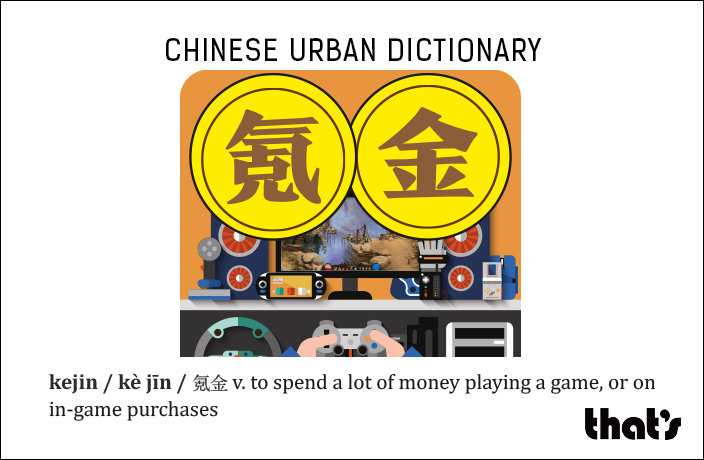 When you drop serious money in an online game, it's called kejin. What's a gangjing? Someone who argues for the sake of arguing. 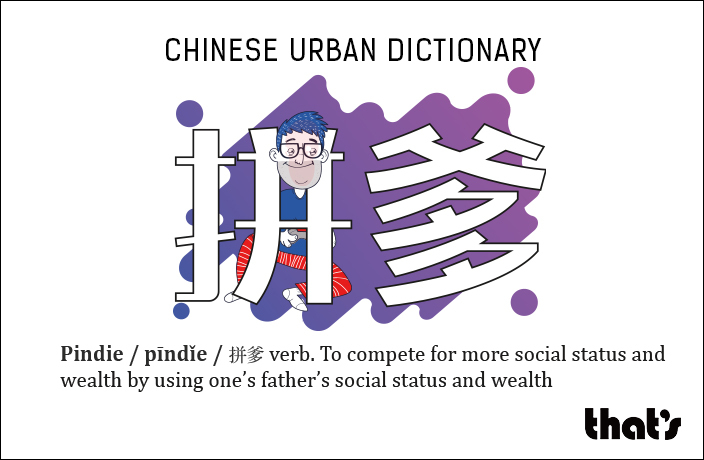 ​Literally meaning “to compete using father,” pindie is the exercise of using one’s father’s achievements to compete with others for upward mobility. 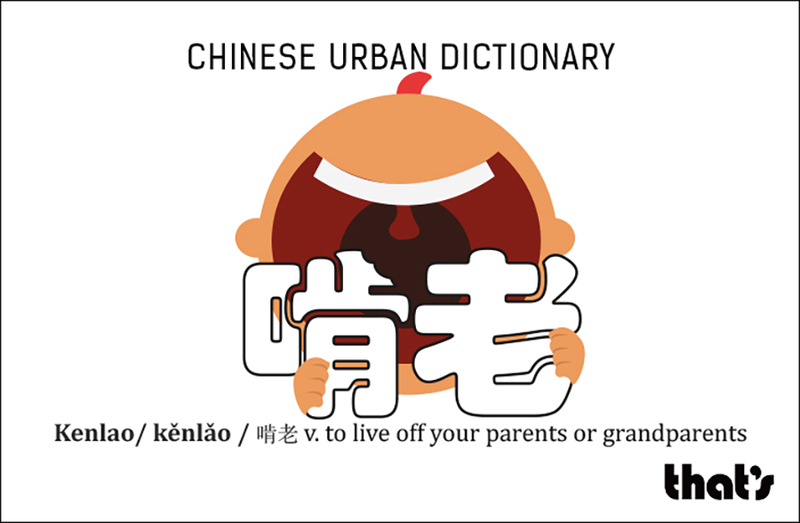 Literally meaning “to gnaw off the elderly,” kenlao is the reluctant choice of millions of young people in China today.